I must be naïve, because I really thought this was a foregone conclusion. The message “Jesus Was Homeless” is printed on the back of Fat Beggars School of Prophets tee shirts and spread all over this town. I would have thought that anyone who ever read Matthew 8:20 would plainly accept it. Anyone who ever read Matthew 25:43 might quibble that in fact Jesus still is homeless. 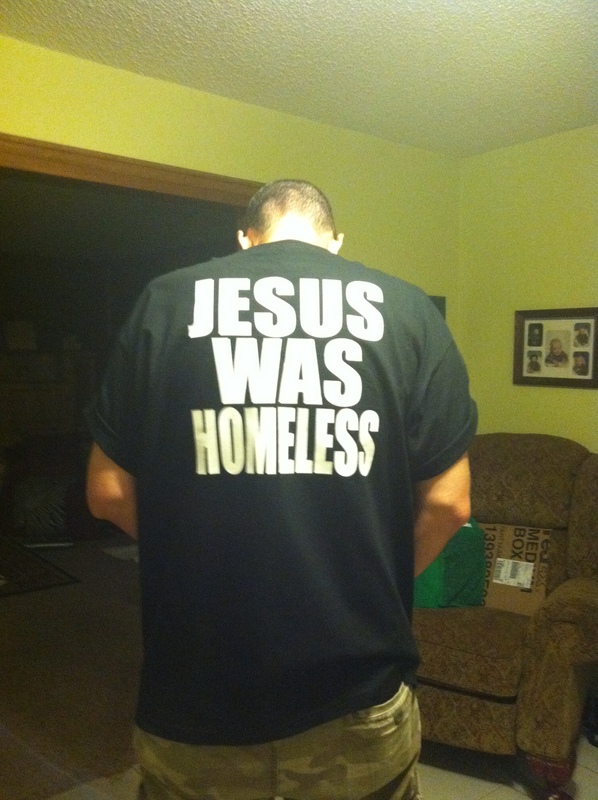 But there is a real push out there to say that Jesus was NOT homeless, and I encountered it at the Mahon Library one day when a stranger approached me while I was wearing one of our shirts to condemn me for the message on it. I was stunned. The man approached, made his comment about how the message was a lie, and then withdrew. He did not come with a reasoned argument to persuade, but merely a jab. I attempted to engage the man in meaningful conversation, but he just slinked off to obscurity. And I thought this was an isolated opinion until I bumped into it on the internet again. Since that post was in fact reasonable, I thought I should post a reasonable defense of the statement “Jesus was homeless” since I remain unchanged in my opinion. First, I am aware that Jesus had a place to stay in Capernaum. And it so happens he crashed at Peter’s house. Apparently, Jesus was welcome to live there long-term and/or frequently. I have no idea whether the house had a deed and whose name would have been on it. But I suspect it was either owned or rented in Peter’s name. Nevertheless, this argument does not settle the matter at all, as far as I can see. At one level, it is a matter of semantics. At a slightly higher level, it is a matter of proof-texting – for after all, even Luke tells us that when Jesus was born, “there was no room in the inn” and the child was “laid in a manger” (Luke 2:7). This strongly suggests Jesus was born homeless, even if briefly and not as a matter of chronic homelessness. Let’s not forget that Jesus as a newborn/youngster lived as a refugee in Egypt (Matt. 2:13). But at a much richer level, a theological level, Jesus represents God the Father in a unique way, and this is the same God of whom King David said, “See now, I dwell in a house of cedar, but the ark of God dwells within tent curtains” (II Sam. 7:2) This is David’s first order of domestic business when his kingdom rule is established: Build a HOUSE for God. Of course, if you have read that story, you know that God tells David that he cannot build a house for God, but God will build a dynasty for David – AND – that David’s Son will build a HOUSE of God. Then as the story unfolds, King Solomon builds a temple for God. But it is a temple that eventually gets judged and destroyed. However, the New Testament writers pick up this theme and characterize Jesus as the Son of David and as the Carpenter who will build the HOUSE of God using stones not made with hands – stones being sons (see Eph. 2:19-22, among others). I only provide a very thin thumbnail sketch here of a rich theological argument, but it lays the groundwork for a very reasonable case that Jesus WAS homeless. And when coupled with Matthew 25:35 where Jesus associates himself with strangers that you might take in, we could easily make the jump to say that Jesus IS still homeless today. All of this on theological grounds! Of course the blogger also said that he does not want to “romanticize poverty.” And I think this is the ground from which his case springs. He does not want to associate Jesus too closely with modern street people who are somehow beneath his contempt. I, on the other hand, want to do exactly that thing. And so in a very real sense, this is where the argument actually arises. Jesus has been associated with the poor, the afflicted, and the scorned ever since Isaiah penned chapter 53. And of course that is the grounding of the scandal of the Gospel. We don’t want to see Jesus in the muck we find contemptuous. And certainly not when we hold contempt for people we think should live their lives better than they do. Homelessness lives right square in the middle of American contempt. That is why, in my opinion, we want to say that Jesus was NOT homeless. And I think it matters, because there are only a handful of warnings about Judgment on the lips of Jesus in the Gospels. They make up a very short list: Don’t blaspheme the Holy Spirit, forgive or else you will not be forgiven, and treat the poor like you would treat Jesus or else you can stand with the goats and go into destruction. Thus, this stuff matters. Going farther yet, this really matters because Jesus wants to live in your heart. Your heart is his HOME. The question is: Does Jesus live in your heart? And of course the follow-up question I would add to that is: How can you ask Jesus into your heart but not ask a homeless man (think Matt. 25:35) into your guest bedroom tonight? In addition to writing blog posts, I have also been reading them. 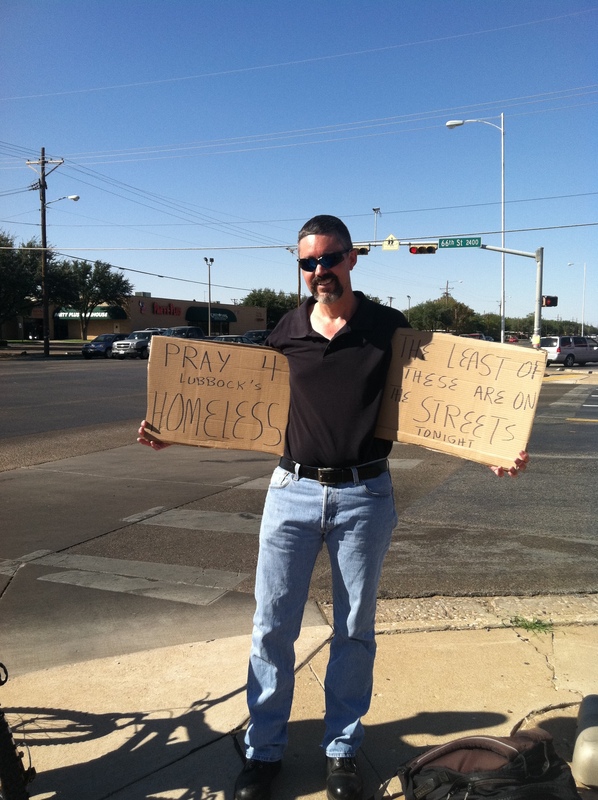 I look for blogs on homeless ministry or even on being homeless as much as possible. Some blogs feature these kinds of things as a matter of routine, some only occasionally. But I am always excited to find a post by a homeless person. But I think I am even more excited to find one by a guy who like me has a home but crashes the streets in an urban plunge for ministry sake. Some of these blogs are just clueless from start to finish. I check in on this one person who claims to live out of a vehicle, and I believe it. This person posts a lot. This person does not actually complain much about the life, but seems to demonstrate the pains of being homeless and a bit dimwitted. I used to read this one homeless guy who lives in Colorado and holds staunch conservative views on politics. This guy would frequently rant about the stupidity of other homeless people and shelters and other services that “only make things worse.” I guess I kind of respected the guy because he talked about how efficient he could live in a tent and save money for getting a room on nights that were viciously cold or maybe if there was a game on TV he wanted to watch. But I really didn’t care for his rants. He seemed to think too highly of himself. He was homeless, but made a regular practice of bashing other homeless people. I didn’t like that. I followed this other guy a few years ago who claimed to live out of his truck while he taught school and coached ball teams in California. He was out of the Army, I think, and lived a very disciplined life for a homeless guy. He would move his truck to various spots almost nightly to avoid attracting attention as a vagrant. He would shower in the locker room. Sometimes he could sofa-surf a few nights with friends and family. He hid his housing condition from his employer though. And one time he posted about how some people from his school parked next to his truck one morning down on the beach. He needed to get out and use the bathroom really bad, but he did not want to expose himself to these people he knew. That was a hoot! He retired the blog a while back to turn it into a book. I hope that is successful for him. I found a survival blog with an in depth post on how to survive the streets as a homeless person. The tips were solid, as I could tell. I have heard some of them from old hands and life-long tramps. Stuff about traveling light, keeping lockers and stash spots, how to lay low and not be seen when sleeping or how to blend in with regular people and not homeless people. This one made me feel that living a lie is important to survival, and that really bothered me. Also it seemed to classify homeless people almost like zombies in a zombie apocalypse, which seemed ironic since if you needed the advice, you would be one of them! Sad, really. I found a ghost blog once that haunts me. This guy passed through Lubbock and stayed at our Tent City, he said, and posted on it shortly after. But his whole blog only had like three posts and it died. I really wanted to reach out to that guy, but he did not ever answer my messages to his comments. There are others. Lots of them. Some quite remarkable too, but this taste I give here is enough for now. But I really must say that I am most jazzed to have found this minister in Clarksville who is camping on the streets as a way to expose the problem and raise awareness. This guy is the most like me that I have found. Actually, I should phrase that the other way round. I am the most like him of those I found. I do not doubt there are important key differences between us, but the fact that he crosses that threshold and joins the ranks of the homeless puts him in a very small category. If you find any blogs that match the kind of descriptions I offer here, please send me a link or something. I learn a lot from them, even when I don’t share their views. If you are reading me, I bet you never read Walter Wink. I have not read much of Wink’s work, but I did read a couple of books and a handful of articles. His work on Naming the Powers, Unmasking the Powers, and Engaging the Powers is deeply influential in Christian theology. He has offered us much and deserves our respect. But I find I love him and hate him almost paradoxically. He feels so liberal at the start of a sentence only to be so conservative at the end. His work trips me out! Well enough about the man and his contribution. I only mention him because he helps me think prophetically. He opens me up. I can’t have stale thoughts after reading Wink. He makes me think anything is possible. When reading his book The Human Being: Jesus and the Enigma of the Son of Man, I found a nugget regarding George Bernard Shaw’s play called Saint Joan. Even a quick glance in the story of Joan of Arc reveals this historic figure as both remarkable and weird all at once. But it is Shaw’s account, which I found amid Wink’s exposition of Jesus that sets my imagination free. Joan: God speaks to me. Robert: That’s just your imagination. Joan: Of course. That’s how God speaks to me. Let that bake your noodle. Wink’s quote of Shaw has never let me go. I grew up in a worldview where the Bible was sovereign. But if God is truly sovereign, then even your imagination must submit. But that does not mean you shouldn’t imagine it. Somehow I am still a person of the book. I take my guidelines from the book. Joan, as history tells us, was all too willing to kill her enemies in the name of God. I cannot imagine that. But the more I seek to imagine the world differently, the more I find worship of God to be the foundation and the means of ordering the world. But the world I think I see ordered there can only be imagined. This freed imagination gives me the desire and the means to prophesy. Let us read a passage from the prophet Isaiah. Then couple that passage, as the Gospels Matthew, Mark, and Luke do with the introduction of Jesus in ministry to the people of Israel. It takes imagination to see that Jesus there prophetically embodies God. He has taken the role of God in the play – so to speak. And you have to learn to imagine that. Not only does your imagination have to learn to accept that Jesus takes the role of God; your imagination has to learn to accept that this prophet will show us what it looks like when God takes the crown and throne of Israel. And your imagination has to learn to accept that all of that has bearing on the world we live in today too. That is a lot to imagine. So what I have to say from here on is going to run a huge risk of sounding like not only is it just pie-in-the-sky, but it admits to it too! But I am not going to give up on the space/time universe. Isaiah doesn’t and neither should we. But we must marry up the idea that the image of God has a powerful effect on the creation. And as I see it, our worship plays an integral role in revealing the image of God. But the kicker is that we only can imagine it. Imagination is our access. You need a really big and rich imagination if you expect this God to live in it. It’s like when you were a child and you pretended to be a grown up driving a car or pretended to be a parent to those baby dolls. You dressed up and pretended to be a soldier or doctor. There was a lot of pretending going on – a lot of play acting. It was like as a child you could try on a role almost like putting on a coat. There was no real bullets in your toy gun and you did not cut a real patient with a real scalpel, but you could imagine yourself in those kinds of roles. Imagination was no substitute for the very real schooling and training that a student must acquire in order to achieve these lofty goals, but nearly every soldier and doctor pretended those kinds of roles as children before attaining them in reality. Nearly every parent pretended to have babies and nearly every driver pretended to drive. I am not saying that pretending to be a dog or a superhero will achieve the same kind of goal. There are limits on what your imagination can and cannot do. I will not explore those kinds of limitations in a post like this. On the contrary, it is enough for me to make the case for the necessity of imagination without getting bogged down in other particularities. So, what I am saying is that playing with your imagination is an important part of the process. In fact, I believe it is God-given. Almost all children do it. It is an important part of growing up. Somehow it seems to get jettisoned along the way, and I think that is a shame. Perhaps this could be at least an element of Jesus’s directive in Matthew 18:3. Especially when you consider that all my talk here about imagination and play is rather humbling. We followers of Jesus need to pretend to be disciples. We need to take on that role at that level of imagination. We need to play at it. And in fact, I think this has a lot to do with prophecy. Consider Ezekiel laying siege to a brick (Ezek. 4:1-3). Why couldn’t Ezekiel just tell the people of Jerusalem, “Hey, God is going to overpower you by means of your enemies and destroy your city.”? Is there something wrong with that message? On the other hand, the method of communication Ezekiel is instructed to use is almost like child’s play: an old man hopping around beating a brick with a stick has got to be humbling for the prophet and for anyone who would heed him. Plus, it is just plain strange. But it is a way of playing and imagining. It is a dark drama, to be sure, but it is still play. And God uses it. God uses Israel’s imagination to speak to Israel. Here at Fat Beggars School of Prophets, we believe God is using Lubbock’s imagination to speak to Lubbock through us. We imagine we are called by God to be prophets and to take up the role of Jesus we find in Matthew 25:31-46 and Revelation 3:20. We also imagine that in the worship – especially in the breaking of bread, that the Luke 24:30-31 Jesus will be revealed to Lubbock in our midst. All of this we find congruent with our foundational role as the Fat Beggars of II Kings 6:24-7:20. Somehow I am still a person of the book. But even there, I imagine God speaks to me and through me. I invite you to imagine it too. Anyone who reads this blog (okay, let’s be honest…), I mean both of you (okay, maybe there is a few more than just two), know that I write here because I think a lot about homelessness. I have a lot of thoughts to share. They are not the usual kind. I buck a few trends and yet hold very close to the Jesus we find in the Bible (as I understand him – of course). And I have a LOT of these thoughts. I think they are worthy of consideration. But in addition to bucking trends, they often require a complex analysis too. This means a bit of “unlearning” before the new stuff makes sense. My thoughts are often challenging in various ways. Thus, I frequently don’t get much of a hearing. I mostly get ignored when and where possible. I want to lay a bit of groundwork for some of my thoughts. I need to expand a couple of categories of thought in your mind. In this post, I will limit myself to the When-Helping-Hurts program. If you will accept this foundational stuff, then I am much more likely to make sense, get a hearing, and not offend when I offer my more pointed thoughts that so often challenge the prevailing trends. I find that my most forceful challenge in any of my usual discourse falls along political lines and comes to a head with the whole When-Helping-Hurts program. In case you are unfamiliar, When Helping Hurts: How To Alleviate Poverty Without Hurting The Poor… and Yourself is a book for people in Christian ministry who find that their efforts to change people’s misfortunate lives often does not actually bring about the desired change and sometimes seems to lead to worse conditions. That is all I will say about the book by way of introduction. There are other similar books in the marketplace of ideas. It is not a one-of-a-kind. But it was the prime shaping force for two programs at two different ministries I attempted to serve with in this town, and in both instances spawned conflict between them and me. So, as far as I am concerned, When Helping Hurts (WHH hereafter) is its own source of hurt. In my view, this book and subsequent programs offer themselves as the wise alternative philosophy and method for helping the poor over against a naïve bleeding heart. And since Protestant Christians and West Texans tend to be politically conservative, this philosophy and method seems to hold Jesus’s care for the poor in one hand and staunch ideals of self-discipline and personal responsibility in the other. It also makes you feel smarter than some liberal, bleeding-heart types too. Basically, the book sells well in my part of the world, and any minister/ministry that champions its ideals stands to raise a lot of money from amid this culture. I have lots of problems with the book, the philosophy it spawns, and the methods it promotes. And they all conflict with Jesus – well most of them do. Some go back to the Old Testament too, which does not directly feature Jesus per se. The WHH program tells us that giving money to the poor is a disastrous thing to do. Jesus says, “Give to all who ask…” (Luke 6:30), and he told at least one rich man to sell all he owned, give it to the poor, obtain his riches in heaven, and come follow… (Mark 10:21). This is exactly what the WHH program opposes. So my first contention here is not that “enabling” is good so why worry about it? Rather it is that the WHH program has gone to the psychologists for a teaching to “help” with our Jesus-mission rather than just trusting Jesus with it. “Enabling” might really just hurt after all. It might hurt the poor. It might hurt yourself. These are the concerns of the title of the book. But if Jesus came and paid the price for your soul, took the pain of your punishment on your behalf, and calls you to take up a cross and follow (Luke 9:23), then he is expecting your mission to definitely hurt you. SO… I am saying WHH is a cross-less Christianity – which amounts to idolatry. No. We don’t need the WHH program at all. I remember a few years ago reading in the paper about an anonymous man giving away $100 bills to poor people he met downtown in areas where homeless people tend to congregate. That was just the first part of the story. The larger part was where a handful of pastors spoke out against it. They called the act “enabling” and foolish. At least one of them even said that if you want to help the homeless, you need to send your money to him rather than giving it to the poor. I was stunned. What if that anonymous man was following the words of Jesus in Mark 10? What if he actually gave away all his wealth? (We cannot know for sure, but it is possible.) If he did, then this man following the very words of Jesus suddenly reads in the paper where pastors of Lubbock come out to decry his obedience to the Master! How does that play in heaven??? Look, I could literally go on and on with this stuff. The fact is, though, that no one ever argues these points with me. If I am misusing Scripture, I invite you to demonstrate that to me. I do not want to be among the goats on Judgment Day; I want to join the sheep. So I take this stuff deadly serious, and I ask you to as well. But in nearly 5 years of resisting WHH, I find myself marginalized on other grounds and mostly ignored. In none of that time has anyone ever said, [Agent X], you are mistaken about Luke 6:30 and Mark 10:21. That’s 5 years of me not being challenged on the merits one bit. So, I figure my challenging thoughts here are for those with ears to hear… But hopefully they will expand this category of thought for future posts. Perhaps you woke up to this news headline about a wedding getting called off at the last minute and the reception then given to Sacramento, California’s homeless. It is a touching story. I certainly want to commend the bride’s family for their kind charity. And though plenty of critics will find cause to beat the When-Helping-Hurts drum, the only criticism I can offer is to ask why the homeless were only invited when the wedding was called off? I have personal experience in exactly this scenario. I want to share with you the story of Agent X and Mrs. Agent X’s wedding. It was way more humble than the headline-making party in this morning’s news, but it was intentional by design. When Agent X asked the future Mrs. Agent X to marry him, they both came from previous failed marriages. Both were children of divorce. Both were keenly desirous to invite Jesus to their wedding and into their marriage. And since Agent X had begun a life in prophetic ministry, we saw the opportunity to invite Jesus to a wedding as something overtly biblical! How do you invite Jesus to your wedding? We decided to make the whole ceremony into an extended communion service. It would be a sit-down meal punctuated with prayer, bread, and “fruit of the vine” at strategic points and an exchange of vows in the midst of it all. No altar, no aisle to walk down, no giving the bride away – all that traditional stuff is nice, but it had not served either us or our parents well. All that mattered was inviting Jesus to join us. It was a relatively uncomplicated idea to invite the poor. We asked permission to host our wedding at Carpenter’s Church. Some of the poorest people in Lubbock can be found there every day. We got the brother-in-law to prepare the fatted calf Texas-BBQ-style and cater the homeless. As the wedding got underway, the bride and groom even made a ceremonial/prophetic walk through the alleys nearby to invite and compel any homeless people we met to come to our party. But throwing a Luke-14 party suggests there would be seats of honor, and someone would have to be shamed into taking a lower seat. How do you shame someone at your own wedding? Who would want to do that? That was a tough question. We wanted to be true to the Luke 14 Script, but we did not want to hurt anyone’s feelings – not at our wedding! That did not seem Christ-like. Perhaps we could ask someone to pretend to take the seat of honor and thus stage the humiliation as an actor (the very definition of hypocrite, btw). That idea just seemed too disingenuous. We wanted to be for real! After much thought and prayer, the X’s decided it was not possible to plan this feature in the wedding. After much prayer and consultation with Script and with others, we decided to quietly drop that part out of the proph-O-drama and scramble the tables in the wedding hall so that there would be no “seats of honor” – except the bride and groom’s seats. We decided we would be the last to take seats so that no one could upstage another. In fact we opted to sit with the homeless at our table rather than family! It seemed that was as close as we could come to honoring that portion of Scripture. Then the ceremony began. Most of our guests were already there at, or around, Carpenter’s Church. 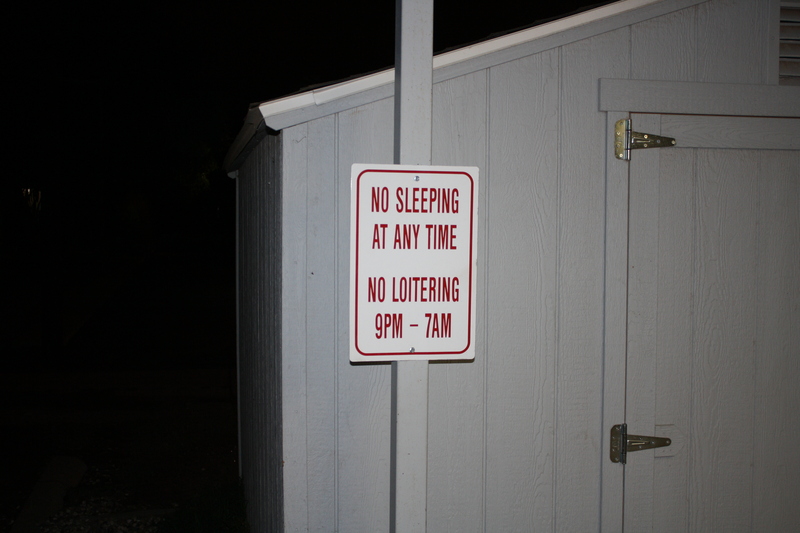 (If you have ever been there, you know it is often surrounded with people loitering under the NO LOITERING signs. Our family began to arrive. Soon, they began to catch the drift of the ceremony. The bride’s aunt and uncle particularly took up the mantel to serve in humility. Seriously. Who packs their own wedding with HOMELESS people? We asked one family member to emcee the affair. He directed us through the party with prayers and comments on each element. The children would actually serve communion bread and “fruit-of-the-vine” as the meal/ceremony unfolded. This was a meal with someone talking us through it, explaining how there would be communion and vows exchanged WHILE we ate. SOMEBODY GET JESUS A CHAIR!!! There were not seats left! But then it became clear to the groom – I have taken the seat of honor out of turn. Whoever sits with the bride has the seat of honor!!! Suddenly the groom jumped up and prevented the drifter’s retreat. The groom put a halt in the whole ceremony and communion prayer as he COMPELLED the man to take the seat next to the bride. The groom rushed around to prepare one last plate of BBQ’d fatted calf and served the man. Then the groom shared the seat with the bride next to this Jesus who did accept the invitation to the Luke 14 wedding party and proph-O-drama! Sadly, that wedding made no headlines. But if we had more weddings like this, perhaps there would be no “broken homes” and maybe even no more homelessness. St. John Neumann’s Catholic Church ANSWERS THE DOOR! Jesus says, “Behold! I stand at the door and knock. If you open up, I will come in and eat with you….” (Rev. 3:20). The same Jesus also says, “…When I was a stranger, you took me in…” (Matt. 25:35). Last night I joined a whole bunch of my street friends at a party hosted by St. John Neumann’s. Praise the Lord, SJN’s hosted us with RADICAL HOSPITALITY! We were fed a hamburger cookout, had live musical entertainment/worship, offered testimonials, held a candle light vigil for our brothers and sisters from the streets who died this year, fed more food and desserts, watched a movie and slept indoors at the invitation of the church. Then this morning we were invited to Mass to share the Eucharist and fed breakfast burritos! This was the first (annual?) A Night Under the Stars offered by Restoring Hope street ministry, which keeps their office at SJN’s. RH was joined by God’s Army street ministry, Divine Mercy Corps of Lubbock street ministry, and Fat Beggars School of Prophets. We shared worship, laughs, food, and now memories. It was wonderful to be a part of this outpouring of love and hospitality. Fat Beggars School of Prophets has been yearning, praying, and working on Lubbock’s imagination for years now in hopes of getting a church to open her doors to the knocking Lord Jesus. SJN’s is the first to answer the door! Thank you to all who participated. You played a part in answering marathon prayers! There is such a deep resistance to following Jesus (and it finds fresh stubbornness in the whole When-Helping-Hurts mentality), that it is refreshing to see a church actually BE Jesus for the poor, rather than avoid loving people in a misguided effort not to hurt them. I strongly suspect Pope Francis’s influence plays a part (he is a hero of the faith for me), and I might have to start drawing cartoons depicting grace bestowed rather than grace thwarted! Thank you Jesus for the ministry I received last night. Thank you St. John Neumann’s for the radical hospitality! Thank you Restoring Hope for all the logistical and administrative, behind-the-scenes work and support you supplied! Question: Does Fundraising Help Ministry? I am well aware that St. Paul raised a collection for the church at Jerusalem. There is no doubt that the collection consisted of money – CA$H, Moola, Dough…. But I am not at all clear that what he did was some form of “fundraiser” but more a collection of contributions. He did not sell stuff. He did not hold a drawing, a raffle, or ask for a suggested donation in exchange for a prize. On the other hand, I think he basically went around the Roman Empire raising tribute for the Kingdom of God. He was like a Kingdom-of-God counterpart to the hated tax collectors Rome employed and Pharisees despised. I imagine it as a fulfillment of prophecy in Isaiah 60:5. Not that such tribute is a drudgery, but quite the opposite actually – a cheerful subversion of empire! (as per II Cor. 9:7). Back to my point though, I suspect that fundraising is something different entirely. When and where it is a matter of collecting contributions, I am sure it is not different, but when and where it is a matter of bake sales and raffles, I suspect it is. And I suspect that the fundraising takes on a life of its own, one that actually impedes rather than spreads the Gospel. Fundraising requires a large measure of focus and energy. Between all the accounting, permits, tax-exemption verifications, advertising, staffing, and “over-head” expenses, the minister has little time and energy left for the ministry all that money is supposed to do. Then there is the near magic way that fundraising seems to enlarge office space, purchase new vehicles, remodel parsonages and impress the media too. Say you want to sell candy bars for a fund raiser. You sell them at $1 a piece. You had to buy them at half that. This means that if everything else were equal, you would be out half the money you raise right off the top. Factor in all the other elements, and how much of that $1 goes to minister to the needy? How much actually translates into real blankets, hygienes, and cups of soup? Stack that number up against the career launch of the minister who raises it all. Why does the donor need a giant teddy bear prize for their service to God? Is Jesus the focus? Does it honor him? Did he raise any money? What does he need it for? I am not prepared to say we need to burn our cash. That is not biblical anymore than fundraising. But I am deeply suspicious of this false god, Mammon. I hate to see ministers/ministries seek Mammon’s blessings. Thus I ask my questions…. I knew I would find some kind of gatekeeper who would want to size me up and spell out the expectations. But the camp was less than a month old at that point, and not well organized at all. Nevertheless, my assumption was right. But the first man I met was a deeply afflicted schizophrenic man who practically never speaks to others. So when I asked him who I should speak with about staying, he grunted and pointed. Welcome to Tent City, Lubbock, Texas! April Fool’s Day, 2011. Sure enough, one of the “managers” greeted me right away. He took my name and ID number and put them in a file. He informed me that I had to provide my own tent, and that a tent was required if I wanted to stay. Other than that, there was no real processing. But he was friendly, and I asked where was a good place to pitch the tent? That’s all it took. Suddenly I had two homeless men taking my tent and setting it up for me in the dusty lot near the congregation of other tents bobbing in the West Texas wind. I was struck by the fact that this was a gated community with a night watchman no less. That is about all it had in common with the well-to-do side of town, but these were important commonalities. However, I was blown away by the radical hospitality. These men just eagerly embraced me and set up my tabernacle for me while I watched. They seemed eager to show off their keen ability to set up a new tent in seconds without reading instructions. I just felt overwhelmed by the kindness. When they were done, I knelt on the floor of the tent to pray and to crawl into it. Immediately the goat head stickers poked into my knees. “Ouch!” I cried. One of the men laughed and said, “Oh yeah, you gotta get some cardboard to spread out under there.” He ran off to get me some. At that moment I learned that every little thing I did at Tent City had some kind of built-in hardship. The tent was hot. The train tracks, just 25 yards outside the compound, erupted in whistles and clatter every other hour. The wind, the dust, the neighbors dogs. If I wanted to use the bathroom, they had a port-O-potty on the other end of the compound – a 3 minute walk roundtrip. It was already a mess and toilet paper sparse. So much easier to pee out the door in the night… I am sure most of my male neighbors did. One of them told me to use a old water bottle and dump it in the morning. “Don’t confuse it for your drink!” he warned. The worst hardship I saw was when the big Haboob blew through town that summer. It made headlines for days. It almost wiped Tent City off the map. Some of the old timers shrugged it off; most of the homeless complained at length. You had to have a tent to stay at Tent City, but several residents lost their tents to the storm. I came into the scale house (the compound is an old abandoned cotton gin complex) and watched one of the “managers” take usable bits of several broken tents and try to repair them and restore a few. He had no tools to work with and no money to buy parts. But every tent he could repair offered some poor soul a chance to stay again for the night. I thought about how far $10 would go to help just then. Meanwhile the counter in the scale house was stacked up with donated pizzas. There were over 30 of them. They tasted great the first day, but after 2 days when over half had still not been eaten, it was time to throw them out. But no one had the heart to put all that charity in the trash. They languished on the counter for hours in front of the manager repairing tents with no tools in the hopes of sparing a couple of people being evicted. I could go on and on. There were multiple facets to these glimpses I share here and many more stories to tell. Most of them express hardship, a few express joy. But this is a blog post, and it is getting too long now. So I will draw the post to a close. But I want to share the experiences I had. I walked a mile in these shoes. I need my home-dwelling friends to know what is going on out there. I need my homeless friends to know that someone came and shared in moments of hardship with them. This post helps me to bridge that gap between Us and Them, and in doing so it confuses whether I am one of Us or Them. It is a distinction I hope (in time) to eradicate. I find myself frequently telling people that worship is our ministry on the streets. I remember one young man who would stop by occasionally and strum his guitar and sing spiritual songs. He did not ask for money; he did not preach. But he lent the sweet sounds of praise and worship to the place like as if he were background music. A bit strange, but touching enough. Actually, that was pretty cool. But there was this one Baptist minister who really put his heart into reaching out. And being a good, conservative, Baptist, he wanted to preach the Gospel and save souls along with his social agenda. In fact, the social agenda was like the sugar that helped the medicine go down. He brought food. But the food was a gimmick – it had strings attached. No food without Gospel. Now, I am not against the Gospel message one bit! In fact, I am all for it. To be honest, if I have to choose between the two, I’m going with Gospel and forgetting the food! (Not a popular idea.) But in his case people felt played by his Gospel. He would put his squad of volunteers to work cooking and preparing a meal while he led a Bible study (hereafter referred to as BS). He passed out Bibles and paper and pencils. His lesson would drone on for about 45 minutes until the food was ready. Then anyone who attended the BS could get a plate of food. And the gimmick was that you had to turn your pencil back in to the instructor like a meal-ticket. If you didn’t attend the BS session, then you didn’t have a pencil; if you didn’t have the pencil, you didn’t get fed the food. I watched this guy go at it hammer and tong. He really tried, and I think he really cared. And he would show up with a church bus that looked like one of those airport shuttles to pick up folks for Sunday church too. Only a couple of older ladies went with him, but he gave it his all. He worked tirelessly for about 9 months, and then suddenly burned out and gave it all up. I have my idea about why that did not work better for him. I heard others complain about it too. He was rather manipulative. Perhaps there is no way around that in some sense, but in his case that is what it all felt like from start to finish. It felt like he tricked us into sitting through his otherwise boring BS so that we could get a good burger. Lot’s of ministers came and went, but this one guy really put himself out there, yet burned out in a matter of months when the homeless didn’t take to Jesus or the white, middle-class lifestyle like he’d fantasized. It seems it left a bad taste in his mouth for the homeless. I have not heard from him in a long time now, but I suspect he spouts those familiar clichés like “Those people are lazy… some of them really want to live like that… they aren’t like us…” and so on. When I speak of worship as ministry, his kind is definitely NOT what I mean. I have encountered other ministries in other places where they cut the manipulation out by hosting a meal first and then inviting those who are interested to stay for the BS after if they want to without coercion. And that seems to be a bit better in my book, but it also is not what I am talking about, aiming at, or doing. When Fat Beggars School of Prophets offers worship as ministry, we seek to employ the homeless (at least the humble among them) as human image bearers for God in ministry to the larger society. And as we explore this notion, we find that happens best in worship. I will detail that more another time. For now I just want to distinguish my use of the phrase worship as ministry from the misconceptions it might easily imply. I had the pleasure of answering questions about this street ministry at the Vandelia Church recently, and it makes sense that I write more about us. This will make a great way to introduce us and open the doors for Jesus. It aids by answering who we are and how to join us. Agent X began a career in ministry to addicts at the One-Eighty House in Abilene, TX back in 1999 and a career in prison ministry back in 2000. In 2002, I moved to Lubbock, TX and joined The Shepherd’s Servants, a prison after-care ministry. In 2004, I moved out to the streets reaching out to addicts, pushers and prostitutes with a party. This party changed everything. The ministry began taking on prophetic dimensions. And it was about this time that I read a book by Tony Campolo called The Kingdom of God is a Party. We stopped a murder with that party one night. (More on that another time, but) I suddenly found myself more open to the idea of prophetic ministry when that happened. It seemed that the chaos of the streets responded to a humble worship party in profound ways my partners and I could not ignore. In 2008, Agent X joined an all night prayer vigil with the homeless of Lubbock. I will not lie, I got cold that night and went home at about 3 in the morning. But when I crawled into that bed and warmed up, I think I took the homeless with me in my heart. I became deeply saddened by the situation I had just left and angry that this “Christian” town does so little to address it. Agent X moved to tent city (as a weekend warrior of sorts) in the spring of 2011. But after a year of prayer and relationship building there, I came to realize that tent city only served a fraction of the homeless of Lubbock. I became more intimately aware of so many logistical concerns involved in outreach in general, but also more intensively aware of how little worship is considered as central to that outreach. 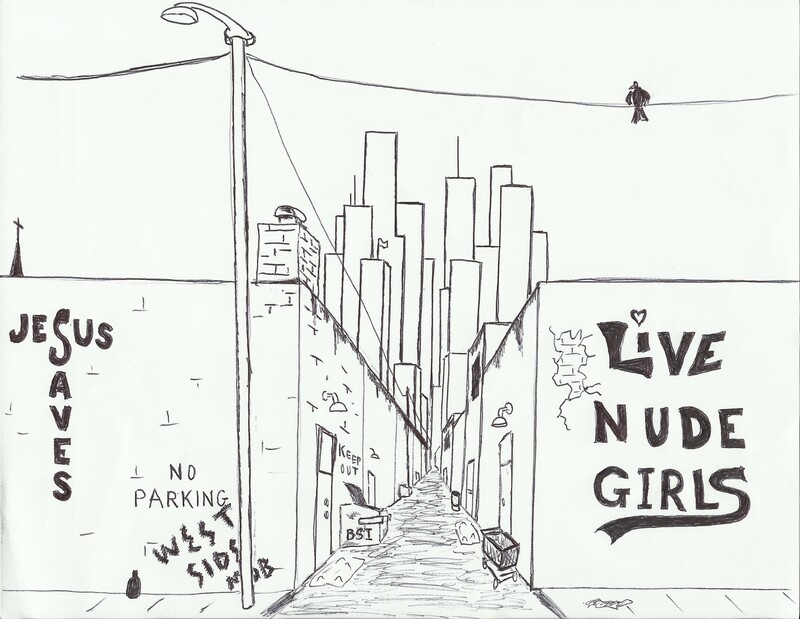 I began hitting the streets in a self-styled urban plunge. 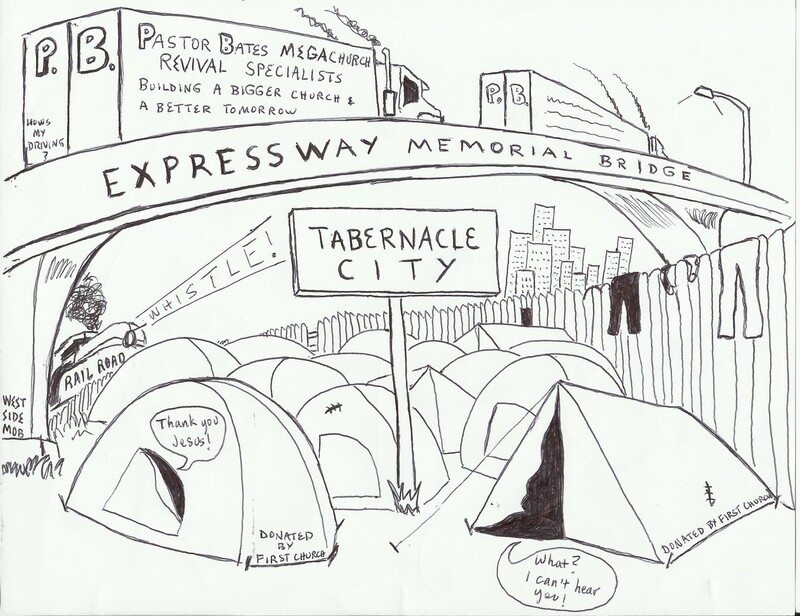 In time I found myself attending the Premier Homeless Church (not its real name). I became a volunteer there. That bunch (nameless in this post) was known for opening up their worship facility to host all-night prayer services which subsequently allowed the homeless to take nightly shelter from the cold in previous years. I admired that. It seemed subversive and prophetic to me. I wanted to join. The first year Agent X was attending at the Premier Homeless Church, I volunteered to chaperone groups of people in the facility on cold winter nights. But the second year there, I was informed by leadership that we would not open the doors to the poor and homeless on various winter nights. I protested this decision. Reasons given for the decision were lame. I was told we did not have volunteers. But that was not true. I was told that such help was “enabling” of the poor. I quoted Jesus from Matthew 25:40 and Revelation 3:20. None of the arguing opened the door again. Our little group of homeless men and Agent X’s family chose to look into an obscure little passage of the Bible that day from II Kings 6:24 – 7:20. We saw how that in Samaria, the people of God were under siege, starving, and helpless. The economy had tanked, and everyone was looking out for their own interests at the expense of others. And in the midst of all this, God used a handful of humble beggars to send his Gospel Message to the king and the nobles. But not before feeding them from his table. That day the Fat Beggars School of Prophets was born. We embraced a call to a life of prophetic ministry where we would take our Jesus meal – communion – to the streets and share it with other homeless men and women. Actually, we invite all of Lubbock to join us. But even if Lubbock does not join, we will bear the image of God in the breaking of bread (Luke 24:30-31) as we commune on the stage of street corners, back alleys, empty lots, and in front of locked up church house doors. Shortly after that day, we began taking communion to the streets and finding homeless people joining us in worship. Agent X would often camp out with congregants, pray with them, sing with them, listen to them, and share the meal with them. Most of this was inspired by the work of Shane Claiborne, a student of Tony Campolo. But let us not forget that during this time, Agent X was haggling with the leadership at the Premier Homeless Church trying to negotiate a reinstatement of the long-standing practice of opening the church house doors for the homeless on cold nights. I attended meetings called by leadership on numerous occasions and traded scores of text messages and emails regarding the issue. Resolution was not reached. 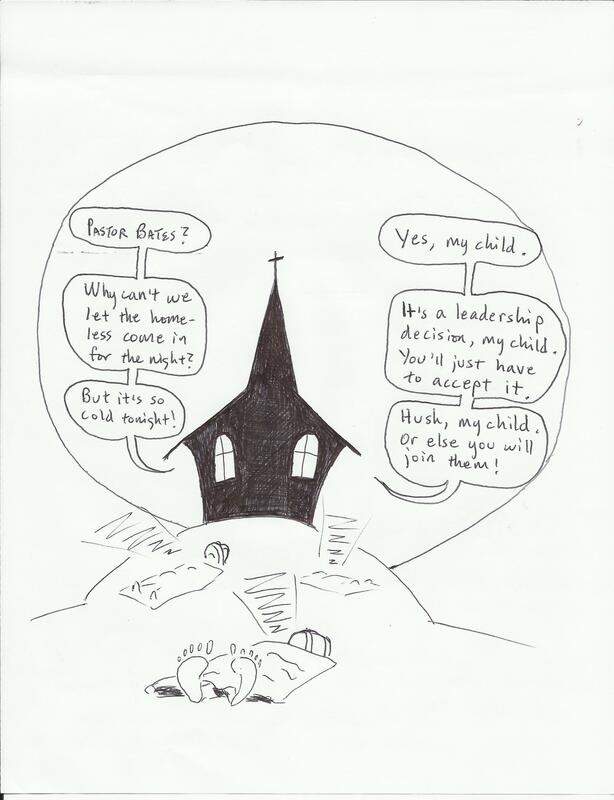 Leadership became entrenched in the new position. I became entrenched in the old. Agent X then led a communion service at the locked door of the premier homeless church under the watchful eye of the security camera. Several other homeless people attended that prayer service and took communion as we knocked on the locked door quoting Revelation 3:20. 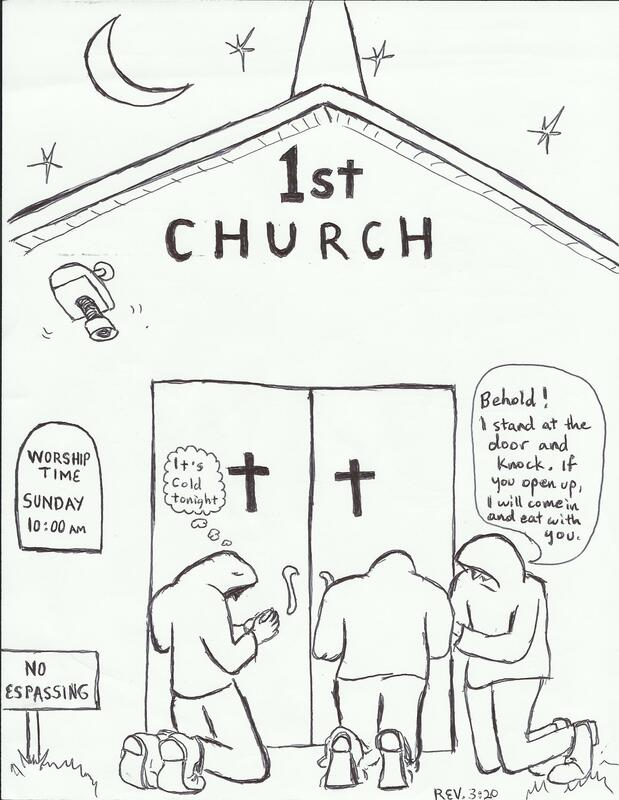 Shortly after that, I was kicked out of that church. Agent X also began publishing pamphlets called The Fat Beggars’ Spot – a Revolutionary Rag. This pamphlet also is subversive and does not apologize when it confronts the position of the larger church culture and puts them on notice with God’s word in front of the homeless population as witnesses. Thus the prophetic edge is sharp and it cuts. Sadly, there seems to be a fight. A lover’s quarrel to be sure, but still a fight. And the fight is to get the people of God to be the people of God. WWJD? Here at Fat Beggars, we think he confronts the powers that be and tells them that Jesus is Lord and King of Israel. This Lord and King is also a Shepherd of the Sheep. He is knocking at your door. If you open up, he will come in and eat with you! The Fat Beggars are getting fat on the meal Jesus gave us while the church is starving inside the city. But if you open up to us, we will destroy your current world order as WE ALL LEARN TOGETHER WHAT IT IS TO EXPERIENCE GOD’S KINGDOM RULE AND WILL BE DONE ON EARTH LIKE IT IS IN HEAVEN! This is just a nutshell view of Fat Beggars School of Prophets, but it is the lens we hope you will appreciate. We don’t really need to raise a whole lot of money. We don’t have to deal with logistics. We just ask the church to be the Body of Christ and do what he does as he walks those dusty Galilean streets and trails. Then we will all be children of God. You can join us very easily. When you see a group of homeless people knelt on a street corner or in a city park sharing prayer, just get out of your car and your comfort zone, walk over to us, and kneel before the Lord in prayer. If we knock on your door, open up. It is Jesus you are inviting in with you (Rev. 3:20/Matt. 25:40). Believe me. This changes EVERYTHING!